The CKC SuperPen drawing and graphic design pad is yet another ergonomically sound way to break-up your typing needs and day-to-day repetitions. The "input device" is not a mouse, but a wireless pen stylus with programmable dual buttons integrated into the lower portion of the barrel. A powerful, ergonomic tool, the CKS SuperPen validates several studies that show wireless upright (pen-like) input devices trump the mightiest mice when it comes to avoiding RSI (repetitive stress injuries). 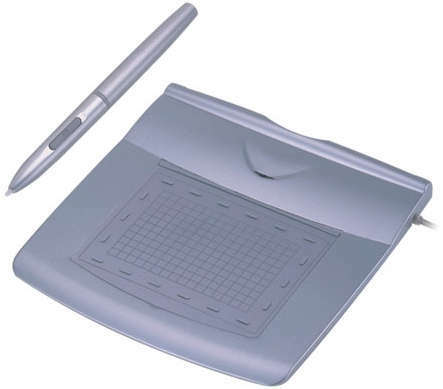 With graceful, flowing pressure-sensitive feedback, Comfort SuperPen Tablets minimize strain and maximize input comfort... the pen/stylus offers the same feel of smooth, gradual input and transparent overlay that one receives when working on real paper. And like any good ball-point you might use to sign checks or contracts, the stylus features a tapering waist and flares at the index finger's natural resting position to provide subtle support and intuitive placement for left and right clicks on the stylus barrel. SuperPen Mouse Tablet available in 4"x3.5" and 5.5"x4" sizes. The sensitive tip of the styles registers 512 unique levels of pressure for nuanced shading and artistic drawing in programs like Photoshop or PSP. Please call Comfort Keyboards at (414) 431 4622 to locate a dealer in your area today!